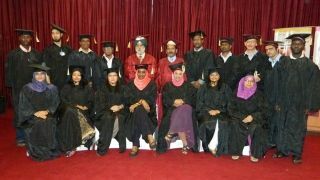 At World Laparoscopy Hospital, Graduation Ceremony of Fellowship ad Diploma integrated course was help on 28th of April 2014. Full academic dress was worn at degree ceremonies, including a mortar board or soft-cap, by surgeons and gynecologist. The graduation of Fellowship and Diploma in minimal Access Surgery is a celebration of their achievement and marks the beginning of an amazing journey as a qualified Minimal access surgeon. As they leave the World Laparoscopy Hospital and begin their life after WLH with more skill, but they be attached with WLH and interact always our member are and all our member will be doing so as an alumnus.